There was a visiting instructor teaching yoga today, Dana from the Laughing Lotus in San Francisco. She was vibrant, full of life, and had many sage words. She conjured up an image during the middle of class that was so gorgeous, I want to share it with you. She was leading us through deep belly breaths and spoke about how conscious breathing stirs up the elixir inside of us. Once our internal elixir is roused she said, a fragrance begins to course through our bodies. What a rich and gorgeous reflection for yoga class and everyday existence! Dana’s imagery reminded me of my favorite line from my favorite Dylan song, “let me smell of wildflowers flow free through my blood”. It’s from “Let Me Die in My Footsteps,” a profound song about exactly what Dana was speaking of. Live your life, be present! (It’s also got an anti-war sentiment). 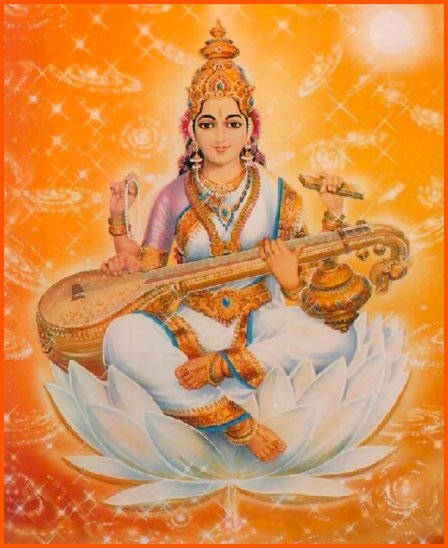 Image of Saraswathi from Hindu-info.com. Saraswathi is the goddess of knowledge, music and the arts. what a lovely, lovely thought to share…thank you, Trish! Beautiful Trish, Yoga teachers have such profound wisdom. Thank you for sharing this.